never apparently gentry but yeoman farmers. One branch of the family owned West Bilney Hall, but a lot of money went out of the family to Australia and they got into financial trouble in the 1890’s depression. They sold the Hall to the Allenbys. David Brasnett believes that the new owners wanted to convert the 2 storey building into a 3 storey. They took the roof off, someone died, and there wasn’t enough money and the house fell into ruin. After the 19th Century the Brasnetts continued to farm in Norfolk but not in East Winch, till David returned from Blackborough End in the early 70’s. As a boy he lived at High House, Fordham. There was from childhood a close link between Jean and David’s family. When Jean’s father married David’s aunt Gladys in 1932, Gladys became Jean’s stepmother. Gladys’ new husband, the Scottish Mr Cuthbert, had got to know her through friendship with David’s father. Gladys nursed David’s grandfather till he died. Mr Cuthbert would come to see her then, with a bunch of flowers incongruously clutched in his fist. Gladys refused to meet any of Mr Cuthbert’s four children while they were courting, except for Bert, the eldest, then aged 12. Jean thinks Betty was bridesmaid at the wedding; the rest of them met their new step-mother, along with her new piano, only on the couples return from honeymooning in Scotland. On marrying Gladys retired from playing the organ at East Winch Church. This put the PCC into a tizzy. What on earth were they to do without an unpaid organist. The vicar’s daughter Miss Gray stood in for a while at £12.00 per annum. Prior to her marriage Gladys used to take David to church on the back of her bike so that he could pump the organ for her. He was so small that when the pump handle was raised he was almost lifted off the floor. Some times something would come unhooked inside the organ and David had to squeeze into the organ case to fix it. David Brasnett died on 16 August 2013. The following obituary was published in The Lynn News on August 30th. 2013. A West Norfolk farmer, who was the last in a family line that could trace its agricultural roots back to the 156os, has died at the age of 91. David Brasnett was born into a farming family at Home Farm, Blackborough End, Middleton, on May 4,1922, where he spent his early years before attending King's School Ely as an eight year-old. He remained a farmer up to his death at the Norfolk and Norwich University Hospital on August 16th 2013. When war broke out, David continued his early farm work andjoined the Local Defence Volunteers which later became the Home Guard (of Dad's Army fame). His father, Hugh Brasnett, who was then farming Blackborough Manor Farm and several other untenanted farms in the area, was appointed'special constable'. day I worked with sheep, untrained and uninstructed ... I had to find out for myself." first obtain mechanic qualifications. After basic training in Blackpool he, together with other smart young airmen, was also used to drum up support for the war effort. At Kirkham, Lancashire, he qualified in aircraft engine mechanics, later gaining additional experience working on Oxford trainer aircraft. In early 1941 he boarded the Abosso troop ship at Liverpool and made the long, slow journey (at eight knots) in convoy via Scotland to Freetown, Sierra Leone and then on to Cape Town managing to avoid both U-boat attacks and a deadly outbreak of meningitis on the way. was based at Kasfereet, where he was given the job of retrieving RAF spares in the desert ahead of Rommel and his troops, who were advancing speedily towards Cairo. "This was a tricky job", he wrote, "and we had to be very careful not to get captured. Next we had to make sand runways for the remains of our airforce to land on. in the desert behind El Alamein." During a period of leave he worked on a Kibbutz, or collective farm, in the north of what was then Palestine. Subsequent weekend passes and breaks were spent exploring Jerusalem, The Dead Sea, Galilee and Cairo where friendships were forged that would last a lifetime. When his father was taken seriously ill in 1944, David was called home on indefinite leave to help run the family farm. The situation at Blackborough Manor Farm meant that he was unable to take up the place he had been offered before the war at Emmanuel College, Cambridge. In September 1946, after marrying Jean Cuthbert, a Scottish farmer's daughter from Ayrshire, he farmed Priory Farm, Blackborough End, later in conjunction with Blackborough Manor. In 1970 David purchased Hall Farm, East Winch, which he continued to farm for the rest of his life. David was always an active supporter of the local church. At East Winch he began "Trowel Days" aimed at maintaining and repairing the outside fabric of All Saints Church; and he served as a church warden at both Middleton and East Winch for almost 40 years as well as lay-chairman of the Synod. He helped setup, and was a founder member of, the farming co-operative, King's Lynn Farmers; served on the local drainage board for 25 years; and, having joined in 1949, enjoyed one of the longest memberships of the National Farmers' Union. Together with his wife Jean, he moved to Aylsham in 1997 where he embraced every aspect of friendly, market town life. The local history society, for instance, satisfied some of his thirst for additional local knowledge. He was a firm believer in keeping his brain active and challenged with a daily crossword puzzle and expanding his Spanish vocabulary up to the time of his death. It took a heart condition in his 8os to slow David down sufficiently to allow him to sit still long enough to master basic computer skills. He used his new-found knowledge to keep in touch with friends and family around the world and also to write a series of short stories and anecdotes about the colourful characters and happenings of an agricultural world long gone. "Tall Stories and Short Tales of an Old Farmer" was published in October 2012, with all proceeds donated to the Aylsham Care Trust which works with volunteers to help the elderly by alleviating loneliness in the community and meeting transport needs of local people. David Brasnett is survived by his wife Jean, daughters Susie and Mary, four grand-children and three great-grandchildren. Church, Aylsham tomorrow (Saturday August 31) at 2pm. 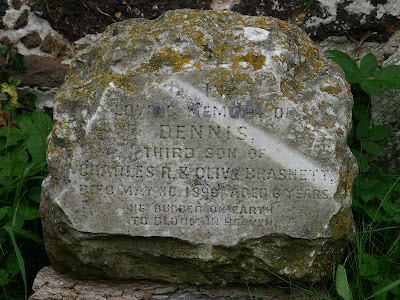 Charles and Olive were living at Marham at the time of Dennis's death, but perhaps they felt they wanted him buried in the family church .